A change taking place on Monday, August 20, will make it easier for many library users to log into CentralSearch and the library’s databases. CCSU users will use their CCSU email and password combination to access databases from off campus or log onto CentralSearch. Because the library’s authentication system is switching to a CCSU-based setup, there will be an improvement in usability for many users. 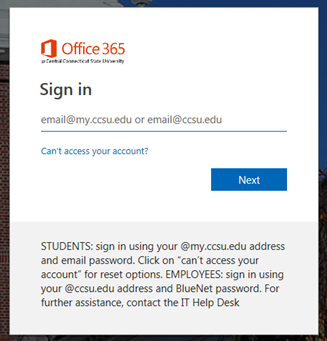 Specifically, this will help faculty and staff whose Bluenet account and email prefixes are not the same and for students (whose email addresses end in my.ccsu.edu). In the past, these users had to remember to login using a combination of their Bluenet ids and an @ccsu.edu suffix. Now, all library users will simply be able to use their ccsu emails and passwords. These accounts are managed via the CCSU Accounts Management System, so passwords used to access the library’s CentralSearch and online resources can be reset through CCSU’s Accounts Management page. Check out CentralSearch’s Help page to review the login process. Previous PostSummer hours update – August 3 to August 27Next PostWelcome Back – Regular Library Hours for Fall 2018!